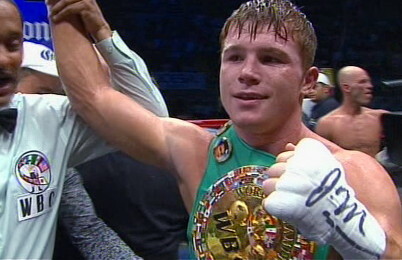 By Dan Ambrose: This Saturday night WBC junior middleweight champion Saul Alvarez (38-0-1, 28 KO’s) will be making his third defense of his title against the struggling 32-year-old Kermit Cintron (33-4-1, 28 KO’s) at the Monumental Plaza de Toros, in Mexico City, Mexico. This is supposed to be a test for the 21-year-old Alvarez, as Cintron used to be a good but very flawed welterweight at one time. However, Cintron has lost a step or two in the past two years and is clearly not the fighter he once was four years ago. Cintron has lost two out of his last three fights and looked horrible in beating fringe welterweight Antwone Smith in his last fight in August 2011, winning by a 10 round decision. Cintron can still punch with decent power at times, but he doesn’t have the same kind of power at junior middleweight that he had at welterweight. Cintron has to really load up with his shots to find the kind of power he once had, and his work rate has taken a dramatic drop. Alvarez doesn’t need to load up with his shots for him to throw with power. Everything Alvarez throws is thrown with power, and he’s a much better boxer than Cintron. Although Cintron box well at times, he doesn’t throw enough punches nowadays and can be out-boxed. Cintron’s only chance of beating Alvarez is to connect with something big and hope he hurts the younger fighter. Alvarez was hurt by the much smaller Jose Miguel Cotto in the 1st round of their fight last year in May 2010. However, Alvarez wasn’t ready for the furious attack that Cotto put on him in that fight, and as soon as he recouped from getting hurt in the opening round, he gave Cotto a bad beating until the fight was halted in the 9th. I seriously doubt that Cintron can absorb that kind of punishment for long without getting stopped. He was bludgeoned twice by Antonio Margarito, and was beaten by Paul Williams and Carlos Molina. Cintron also should have a loss on his record from the Sergio Martinez fight in February 2009, but lucked out when the referee blew the call when Cintron was knocked out by a left hand from Martinez and ruled it a headbutt instead. Alvarez should win this fight without any problems. Cintron is more of a gatekeeper nowadays and struggles when he’s put in with quality fighters. Alvarez is a lot better than him and should easily win this fight and possibly stop Cintron if he opens up with a barrage of punches. It’ll take a flurry of shots for Alvarez to get a stoppage, though. He can’t be economical with his punches if he wants to get Cintron out of there. « Are people writing Manny off too quickly in a fight against Floyd?